Cannes is a city located on the French Riviera. It is a commune of France located in the Alpes-Maritimes department, and host city of the annual Cannes Film Festival, Midem, and Cannes Lions International Festival of Creativity. . In the 10th century, the town was known as Canua. The name may derive from “canna,” a reed. Canua was probably the site of a small Ligurian port, and later a Roman outpost on Le Suquet hill, suggested by Roman tombs discovered here. Le Suquet housed an 11th-century tower which overlooked swamps where the city now stands. Most of the ancient activity, especially protection, was on the Lérins Islands and the history of Cannes is closely tied to the history of the islands. 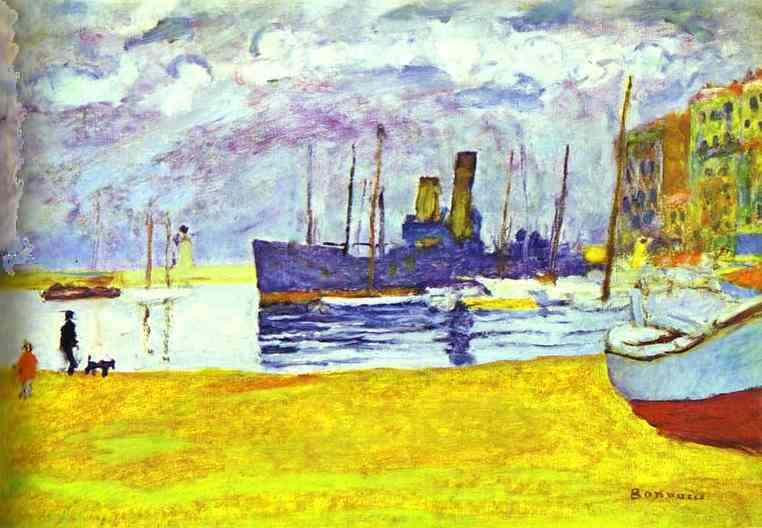 Pierre Bonnard (3 October 1867 — 23 January 1947) was a French painter and printmaker, as well as a founding member of the Post-Impressionist group of avant-garde painters Les Nabis. 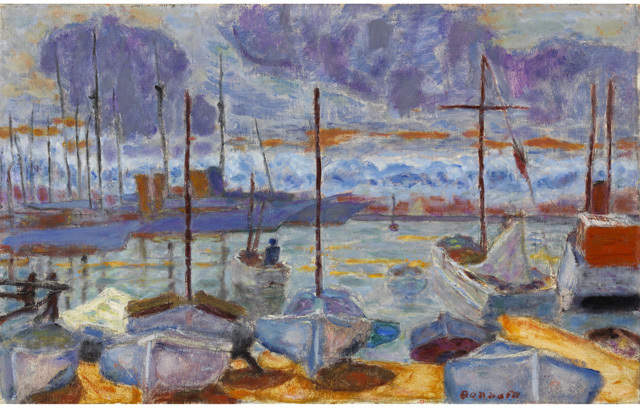 Bonnard preferred to work from memory, using drawings as a reference, and his paintings are often characterized by a dreamlike quality. The intimate domestic scenes, for which he is perhaps best known, often include his wife Marthe de Meligny. The Battle of Trafalgar (21 October 1805) was a naval engagement fought by the British Royal Navy against the combined fleets of the French and Spanish Navies, during the War of the Third Coalition (August–December 1805) of the Napoleonic Wars (1803–1815). Twenty-seven British ships of the line led by Admiral Lord Nelson aboard HMS Victory defeated thirty-three French and Spanish ships of the line under the French Admiral Villeneuve in the Atlantic off the southwest coast of Spain, just west of Cape Trafalgar, in Caños de Meca. The Franco-Spanish fleet lost twenty-two ships, without a single British vessel being lost. It was the most decisive naval battle of the war, conclusively ending French plans to invade England. The British victory spectacularly confirmed the naval supremacy that Britain had established during the eighteenth century and was achieved in part through Nelson’s departure from the prevailing naval tactical orthodoxy. Le Suquet, sometimes called Mont-Chevalier, is the oldest district of Cannes , its “old town”, situated on a hill west of the bay , Old Port. Lord Brougham played his part to speed up the creation of a port at the foot of the Suquet . For a hundred years, the fishermen demanded a dike to protect themselves from the labech, the south-west wind which can trigger fierce storms. Bewitched by the site, the benefactor intervened with King Louis-Philippe. The grateful city erected a statue in 1898 to this providential man. William Lee Hankey (1869–1952) RWS,RI,ROI,RE,NS was a British painter and book illustrator. He specialised in landscapes, character studies and portraits of pastoral life, particularly in studies of mothers with young children. He was born in Chester and worked as a designer after leaving school. He studied art in the evenings at the Chester School of Art, then at the Royal College of Art. Later in Paris he became influenced by the work of Jules Bastien-Lepage, who also favoured rustic scenes depicted in a realistic but sentimental style. He first exhibited at the Royal Academy in 1896 and was President of the London Sketch Club from 1902 to 1904. 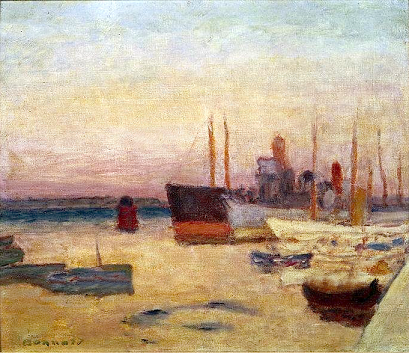 He stayed in France in the early 1900s, painting many of his works in Brittany and Normandy. From 1904 until well after World War I he maintained a studio at the Etaples art colony. It was Hankey’s black and white and coloured etchings of the people of Étaples, which gained him a reputation as ‘one of the most gifted of the figurative printmakers working in original drypoint during the first thirty years of the 20th century’. One that is particularly striking for its stylistic presentation was “The Refugees”, his contribution to raising awareness of the consequences for ordinary people of the German invasion of France and Belgium in 1914. He went on to serve with the Artists’ Rifles from 1915 to 1918. Le Treport is a coastal port town on the English Channel in northern Seine-Maritime, normandy, and just a few kilometres from Eu and Mers-les-Bains, which falls on the Picardy side of the River Bresle. Edward William Cooke, R.A., F.R.S., F.Z.S., F.S.A., F.G.S. (27 March 1811 – 4 January 1880) was an English landscape and marine painter, and gardener. Cooke was born in Pentonville, London. He was raised in the company of artists. 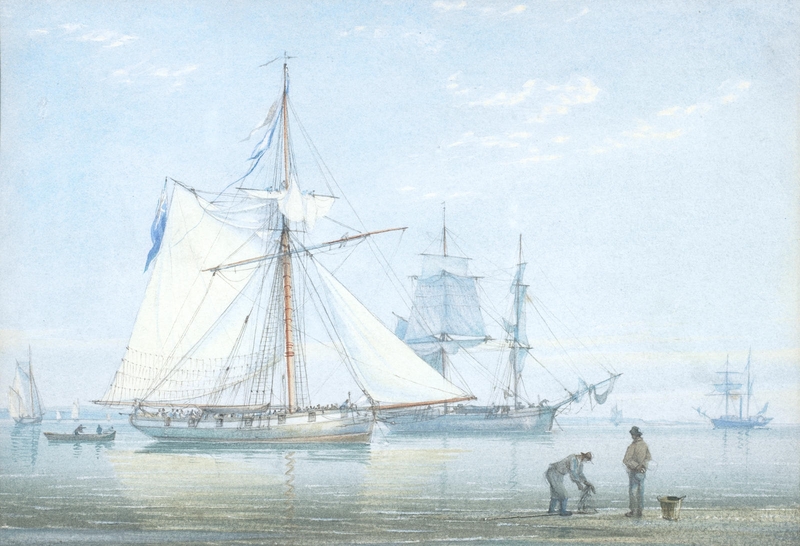 He was a precocious draughtsman and a skilled engraver from an early age, displayed an equal preference for marine subjects and published his “Shipping and Craft” – a series of accomplished engravings – when he was 18, in 1829. 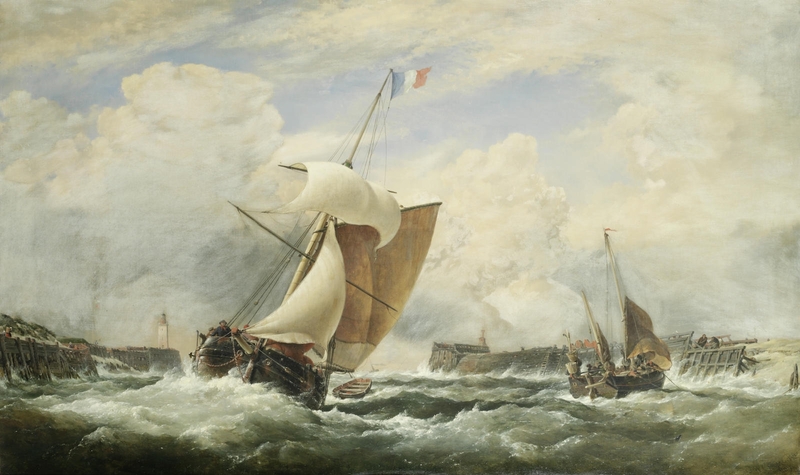 Cooke began painting in oils in 1833, and first exhibited at the Royal Academy and British Institution in 1835, by which time his style was essentially formed. George William Joy (July 7, 1844 in Dublin, Ireland – October 28, 1925 in Purbrook, Hampshire) was an Irish painter in London. He was initially destined for the military and was also an accomplished violin player. After a foot injury at a young age, his father declared him unfit for military service. Joy was then educated at Harrow School and eventually pursued a career as an artist. He studied in London’s South Kensington School of Art and later at the Royal Academy. In 1868 Joy went to Paris where for two years he was a student of Charles-François Jalabert and Léon Bonnat. There he met masters like Gérôme, Cabanel, Jules Breton, Jules Lefebvre und Philippe Rousseau. Going back to London, Joy established himself as a history and genre painter, and became a frequent exhibitor at the Royal Academy, the Salon des artistes français and the Royal Hibernian Academy. He became a member of the Royal Institute of Oil Painters in 1895. 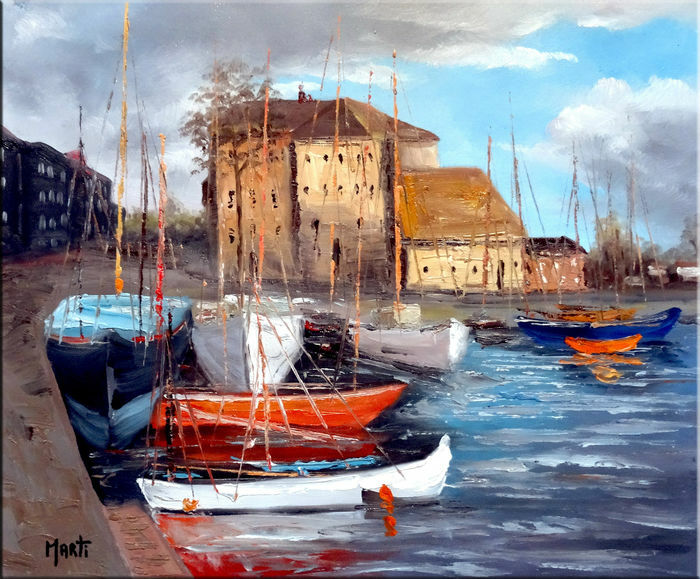 Honfleur is a commune in northwestern France. It is located on the southern bank of the estuary of the Seine across from le Havre and very close to the exit of the Pont de Normandie. Its inhabitants are called Honfleurais. Jan Marti was born in 1958 in Savoy, after a few attempts at studying and various jobs that he quickly gives up, he then devotes himself to painting. He channels his connection to the abstract in hectic and elegant strokes. 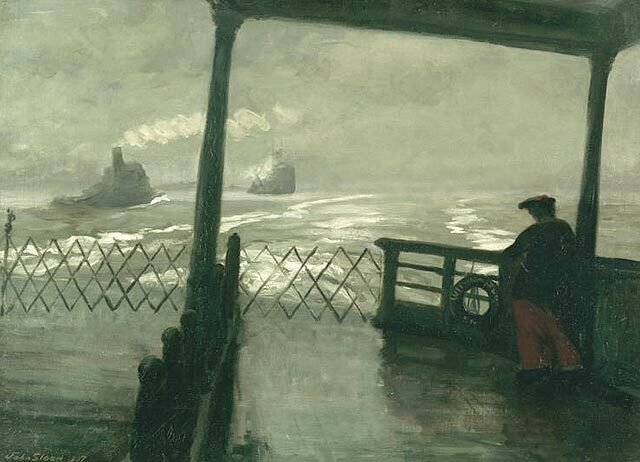 John French Sloan began painting The Wake of the Ferry II in 1907, his second version of this scene. The subject may well have been suggested by Sloan’s ferry trips with his wife from Jersey City to Philadelphia for medical treatments. The stylistic influence of Robert Henri, so pervasive in Sloan’s early work, is apparent here; the scene has been broadly conceived, spontaneously conveyed, and boldly brushed, in a limited palette of grays and near-blacks. The composition reinforces the mood; the ferry’s tilted angle, framing a view of the rough waters, is arresting, and the diagonal of the wake receding into the mist reinforces the sense of loneliness and distance. In this setting, the small figure on the right, understated and half lost in shadow, becomes the essential actor in this version of Sloan’s human comedy and brings into focus its melancholy expression. If you enjoyed this post, please share with friends and family. The Patriarchal Cathedral Basilica of Saint Mark, commonly known as Saint Mark’s Basilica, is the cathedral church of the Roman Catholic Archdiocese of Venice, northern Italy. It is the most famous of the city’s churches and one of the best known examples of Italo-Byzantine architecture. It lies at the eastern end of the Piazza San Marco, adjacent and connected to the Doge’s Palace. Originally it was the chapel of the Doge, and has only been the city’s cathedral since 1807. Richard Price was born in 1962 in Upminster, Essex. 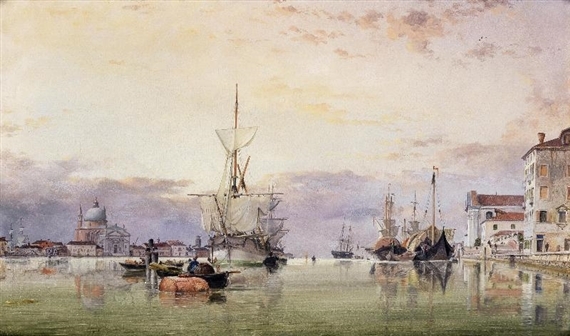 At 11 years of age he started painting and drawing from observing the fishing fleet at Leigh-on-Sea, Essex. Encouraged to simply paint ‘anything’ he quickly was drawn to paint atmospheric conditions and light effects. He later studied at Portsmouth. Price then moved to London and worked as a production design lecturer at the London International Film School. In 2001 he started to make his own images again. Encouraged by his new mentor Jon Bowen he soon resumed his painting. 73 by 100.2cm., 28 3/4 by 39 1/2 in. The Grand Canal is a canal in Venice, Italy. It forms one of the major water-traffic corridors in the city. Public transport is provided by water buses and private water taxis Many tourists explore the canal by gondola. Serge Mendjisky was born in 1929 in Paris. 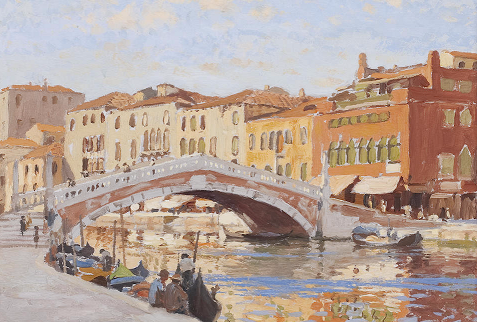 After completing his studies at the Beaux Arts in Paris, he soon became a recognized artist and exhibited in Europe, Japan and the United States. He uses photography to make his preliminary studies in painting. In 2000, he decided to use photography as the only means of expression. He borrows the collage technique to alter photographic images and articulate its multidimensional worldview. The multiple perspectives, expressed in his collages evoke clearly the analytical phase of Cubism. After many years of technical exploration, he found a way to question not only the appearance of the world, but also our perceptual behavior. ANDREW FISHER BUNNER (1841 – 1897). Born in New York in 1841. From 1865 through 1868 he lived in New York and exhibited a number of works at the national Academy of Design. These works included A Summer Afternoon in Pike County, PA. (1865) and The Potomac River below Harper’s Ferry (1868). He spent the year of 1869 in New Jersey and then moved to Louisville, KY. in 1870. He exhibited Study from Nature in West Virginia at the National Academy that same year. He was a prize-winning student at Manchester School of Art, and his first picture was exhibited at the Manchester Academy of Fine Arts in 1894. His studies also took him to Italy. 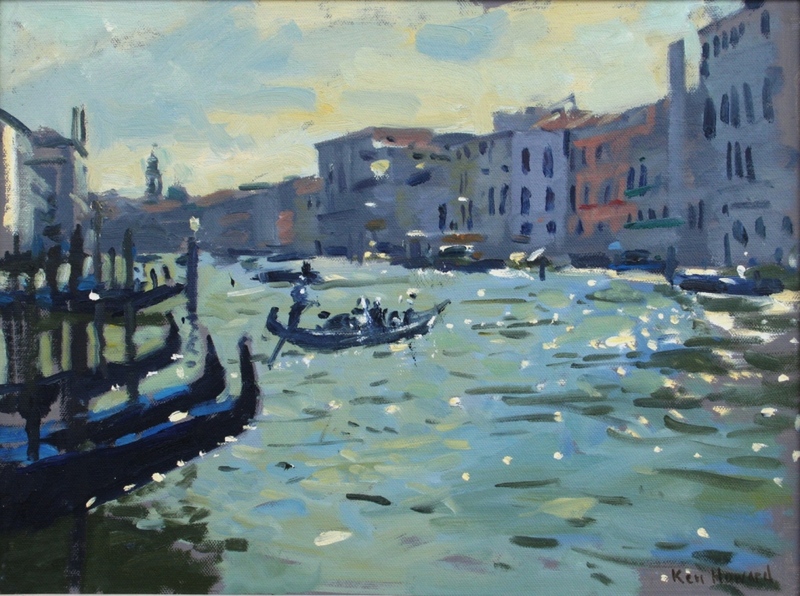 Kenneth Howard OBE RA (born 26 December 1932) is an English artist and painter. He was President of the New English Art Club from 1998 to 2003. 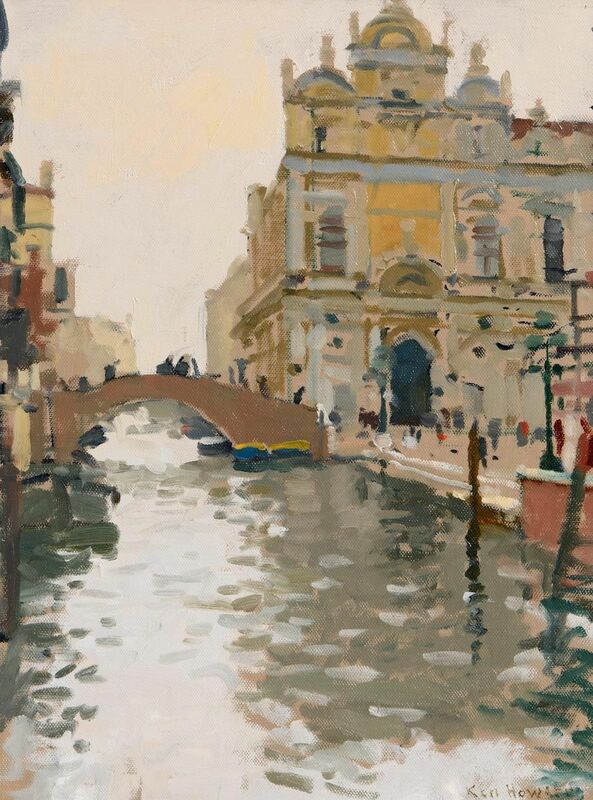 Ken Howard was born in London. He studied at the Hornsey College of Art (1949–53) and the Royal College of Art (1955–58). 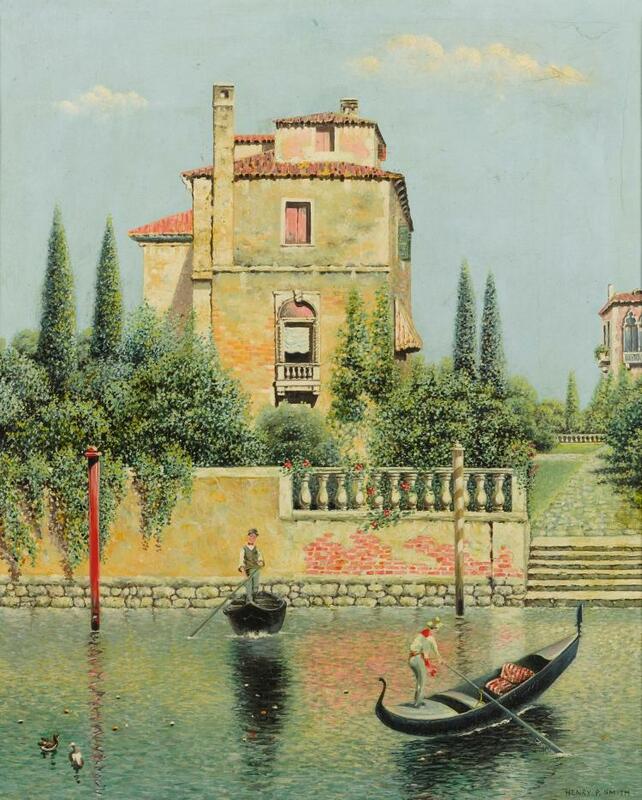 In 1958 he won a British Council Scholarship to Florence. He spent his National Service in the Royal Marines (1953–55). In 1973 and 1978 he was the Official War Artist to Northern Ireland, and 1973–80 worked in various locations, including Hong Kong, Cyprus and Canada with the British Army. 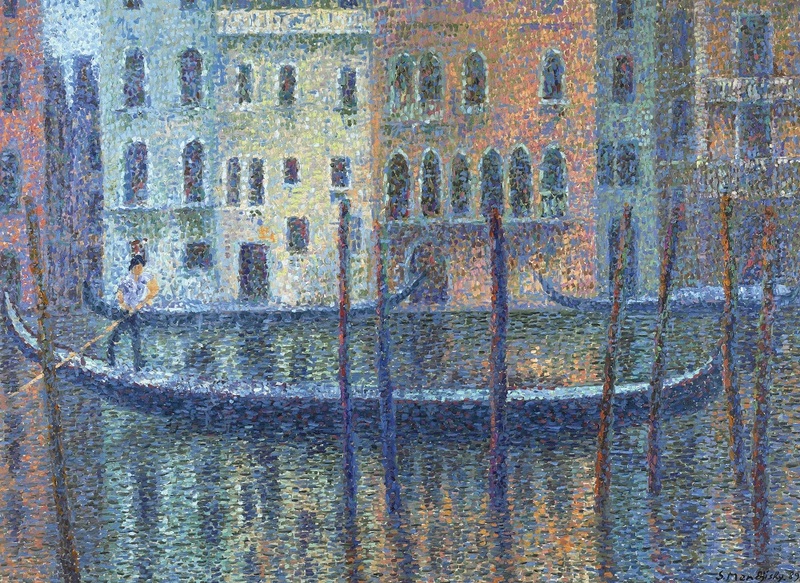 In 1983 he was elected an Associate of the Royal Academy (ARA). In 1998 he became President of the New English Art Club, a post he held until 2003. In 1991 he was elected a Royal Academician (RA). The Basilica di San Giovanni e Paolo, known in Venetian as San Zanipolo, is a church in the Castello sestiere of Venice, Italy. One of the largest churches in the city, it has the status of a minor basilica. After the 15th century the funeral services of all of Venice’s doges were held here, and twenty-five doges are buried in the church. The huge brick edifice was designed in the Italian Gothic style, and completed in the 1430s. It is the principal Dominican church of Venice, and as such was built to hold large congregations. It is dedicated to John and Paul, not the Biblical Apostles of the same names, but two obscure martyrs of the Early Christian church in Rome, whose names were recorded in the 3rd century but whose legend is of a later date. 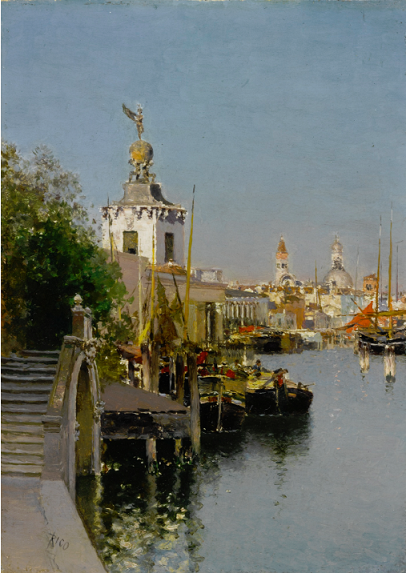 Martín Rico y Ortega (12 November 1833, El Escorial – 13 April 1908, Venice, Italy) was a Spanish painter of landscapes and cityscapes. 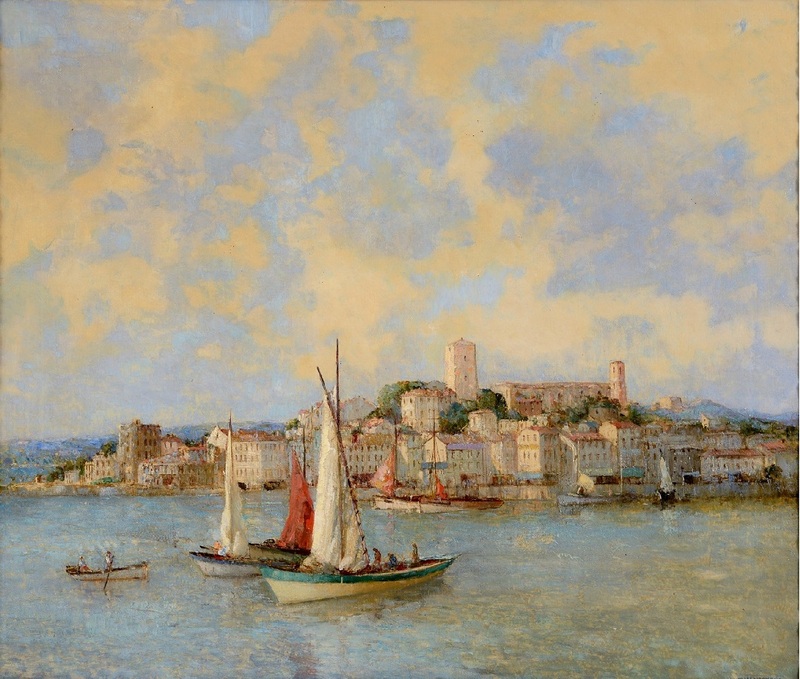 Rico was one of the most important artists of the second half of the nineteenth century in his native country, and enjoyed wide international recognition. Rico was born in Madrid and received his earliest formal training at the city’s Real Academia de Bellas Artes de San Fernando, where he studied under Jenaro Pérez Villaamil, the Academy’s first professor of landscape painting. Under the tutelage of Pérez Villaamil, Rico’s earliest works show him influenced by Romanticism, the style for which his teacher was known. In 1860, having been awarded a government-sponsored scholarship, Rico moved to Paris to continue his studies. His landscapes from this decade depict the French and Swiss countryside in a fully accomplished Realist style. Toward the end of 1870, due to political and social unrest caused by the outbreak of the Franco-Prussian War, Rico decided to leave France and return to his native Spain. The church of San Barnaba is a small Neoclassic-style church in district of Dorsoduro in Venice, It is located in Campo San Barnaba. It is dedicated to the Apostle Saint Barnabas. A church at the site was built in the ninth century, but destroyed by fire in 1105. Rebuilt in 1350, it was reconstructed in present form in 1776. The 11th-century campanile, detached from the main body of the church, has a pine-cone shaped spire from the 1300s. The canal is in a quiet area of Venice. On the banks of the canal are many architecturally beautiful and colorful houses. San Barnaba is a quiet place to monitor the gondolas that pass through the canal. Franz Richard Unterberger was born on August 15, 1838 in Innsbruck, Australia; Died May 25, 1902; Neuilly-sur-Seine, France. He was one of 11 children of an art dealer. Unterberger started his studies in 1853 at the Munich Academy, alongside Julius Lange and Albert Zimmerman. In 1860, Franz continued his studies at Düsseldorf, which was the favored academy for Scandinavian painters studying abroad. Here he produced several atmospheric mountainous scenes. 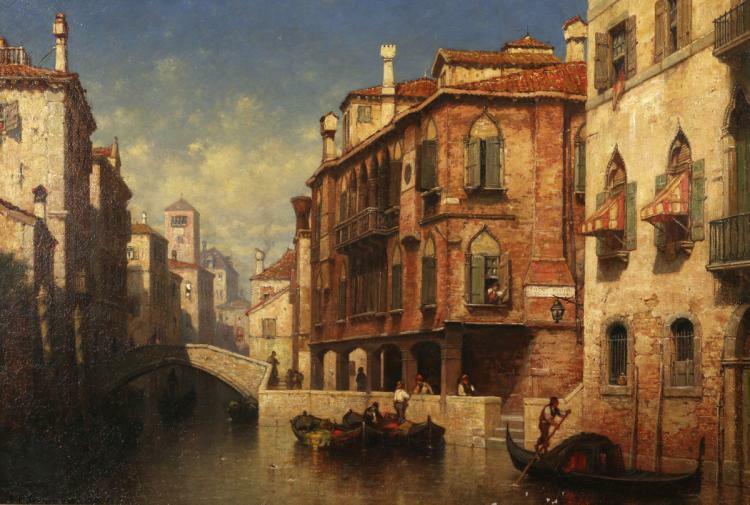 By the 1870’s Unterberger was already exhibiting in major cities across Europe including: Paris, Boston, Munich, Brussels, Berlin and Vienna among others. 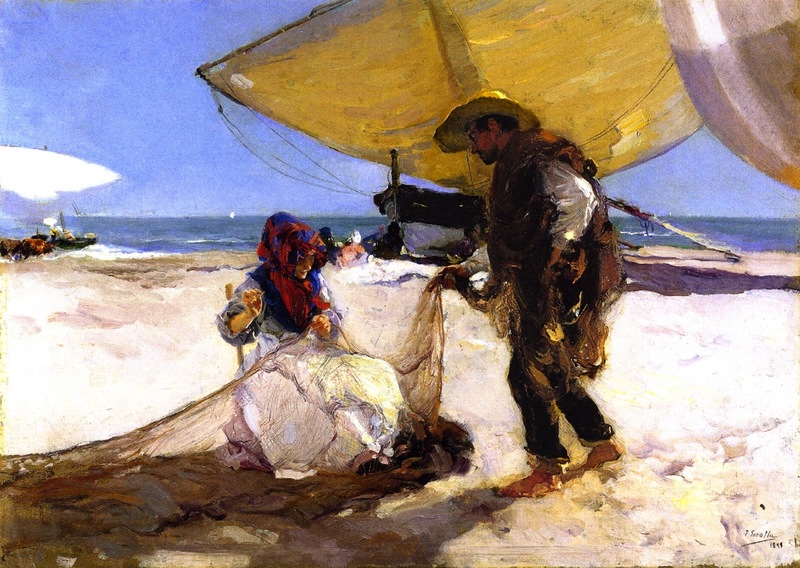 Benjamin Chambers Brown (July 14, 1865 – January 19, 1942) was a California Impressionist landscape artist. He was one of their five children. He grew up in Little Rock, Arkansas. Brown was trained as a photographer. He studied at the University of Tennessee, and later at the St. Louis School of Fine Arts under Paul Harney and John Fry in 1884. He studied in Paris at the Académie Julian under Jean-Paul Laurens and Jean-Joseph Benjamin-Constant in 1890. During his early career, Brown traveled and worked in St. Louis, Little Rock and Texas. In St. Louis, Brown taught at the St. Louis Art School. He went on to open his own school in Little Rock. He initially specialized in portraiture and still life. Upon moving to Pasadena in 1896, he began to paint landscapes. 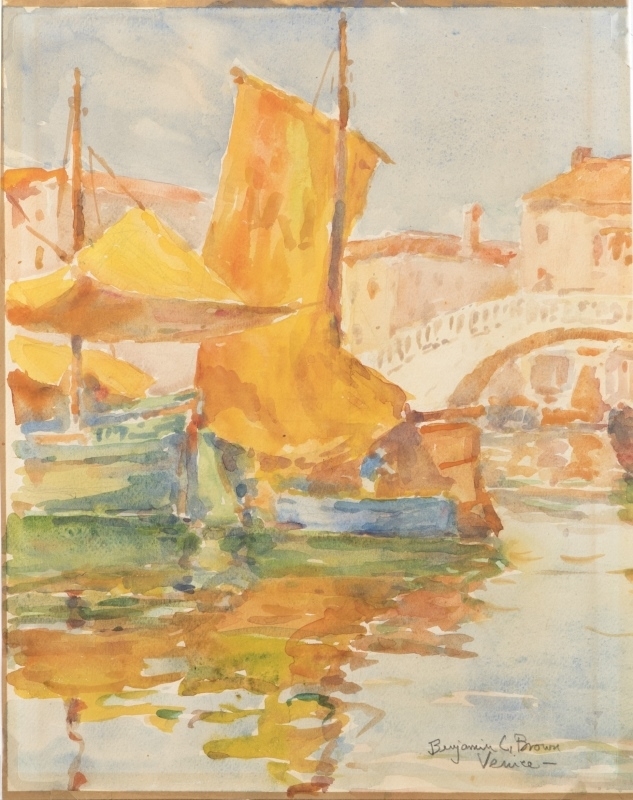 By 1905 he had become famous for his paintings. From 1909 to 1910, Brown had a studio in Mill Valley, California. His first etchings were done in 1914. He co-founded the Print Makers of Los Angeles with his brother Howell in 1914, which later became the Los Angeles Society of Printmakers. His notable works include his impressionist landscapes of Sierra peaks and field poppies. 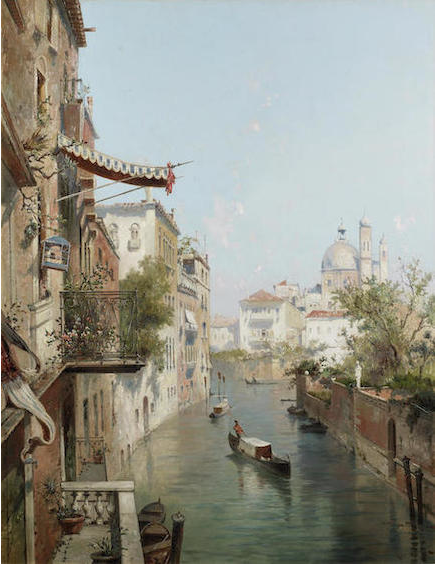 Henry Pember Smith (February 20, 1854 – October 16, 1907) was an American painter, best known for his depictions of country cottages and river scenes around Lyme and East Lyme, Connecticut, and paintings of the sea and shore in New Jersey, Rhode Island, and Cape Ann to Maine. 15 x 60.5cm (5 7/8 x 23 13/16in). 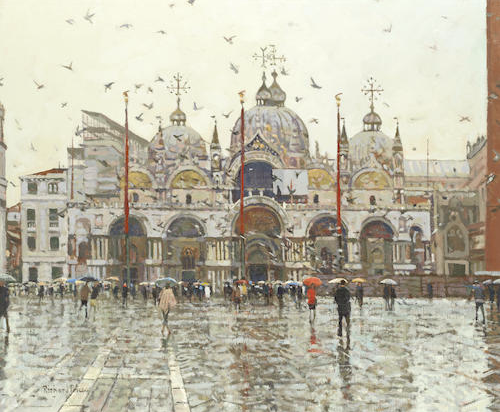 Ken Howard R.A. (British, born 1932) studied at Hornsey School of Art from 1949 to 1953. He then did his National Service with the Royal Marines before returning to study at the Royal College of Art from 1955 to 1958. He went on to win a British Council Scholarship to Florence from 1958 to 1959. Howard’s first solo show was held at the Plymouth Art Centre in 1955. Subsequent exhibitions were held in 1966 and 1968 at the John Whibley Gallery. From then on he exhibited extensively, both nationally and internationally, particularly with the New Grafton Gallery from the early 1970s. 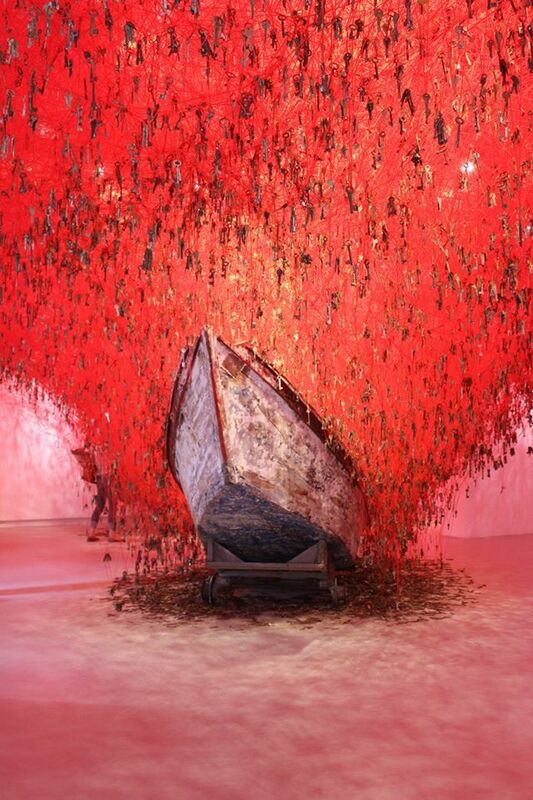 He was given a retrospective in 1972 at the Plymouth City Art Gallery and in 1973 and 1979 was appointed by the Imperial War Museum as official artist in Northern Ireland. He also worked with the British Army in Germany, Cyprus, Oman, Hong Kong, Nepal, Norway, Canada, Belize and Brunei from 1973 to 1982. Height: 700 mm (27.56 in). Width: 805 mm (31.69 in). I don’t own any of these images – credit is always given when due unless it is unknown to me. if I post your images without your permission, please tell me. I do not sell art, art prints, framed posters or reproductions. Ads are shown only to compensate the hosting expenses. Thank you for visiting my blog and also for liking its posts and pages. The Continental School, 19th Century comprised a group of artists active in this region in the period. Works identified as being by this group appear regularly at auction. Ludolf Bakhuizen (28 December 1630 – 17 November 1708) was a German-born Dutch painter, draughtsman, calligrapher and printmaker. 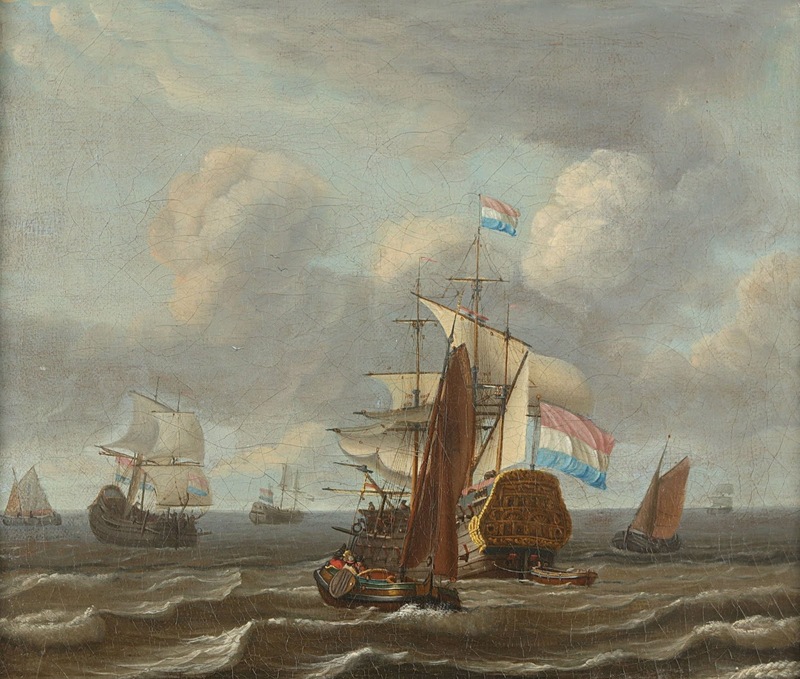 He was the leading Dutch painter of maritime subjects after Willem van de Velde the Elder and Younger left for England in 1672. He also painted portraits of his family and circle of friends. Bakhuizen was born in Emden, East Frisia, and came to Amsterdam in about 1650, working as a merchant’s clerk and a calligrapher. He discovered he had a genius for painting, and relinquished the business and devoted himself to art from the late 1650s, initially in pen drawings. He studied first under Allart van Everdingen and then under Hendrik Dubbels, two eminent masters of the time, and soon became celebrated for his sea-pieces, which often had rough seas. The Last Supper is the final meal that, in the Gospel accounts, Jesus shared with his Apostles in Jerusalem before his crucifixion. The Last Supper provides the scriptural basis for the Eucharist, also known as “Holy Communion” or “The Lord’s Supper”. The four canonical Gospels all state that the Last Supper took place towards the end of the week, after Jesus’ triumphal entry into Jerusalem and that Jesus and his Apostles shared a meal shortly before Jesus was crucified at the end of that week. During the meal Jesus predicts his betrayal by one of the Apostles present, and foretells that before the next morning, Peter will deny knowing him. The three Synoptic Gospels and the First Epistle to the Corinthians include the account of the institution of the Eucharist in which Jesus takes bread, breaks it and gives it to the Apostles, saying: “This is my body which is given for you”. The Gospel of John does not include this episode, but tells of Jesus washing the feet of the Apostles, giving the new commandment “to love one another as I have loved you”, and has a detailed farewell discourse by Jesus, calling the Apostles who follow his teachings “friends and not servants”, as he prepares them for his departure. In the Abrahamic religions, Gabriel is an angel who typically serves as a messenger sent from God to certain people. She studied at the National High School no. 5 of UNAM and then she continued her social anthropology studies. She also studied graphic design for movies in Royal College of Art of London, painting in Rome and music in Rio de Janeiro. When she returned to Mexico, she finished her arts studies. Her work and paintings have been exposed in several countries. Pierre Gourdault ( Paris , May 18, 1880 – Givenchy-le-Noble , January 5, 1915 ) was a French painter. He was the son of Peter and Leonie Marie Gourdault Fonsse; and was the husband of the artist Marie Anastasie Martin Prudence, better known under her stage name Marie-Gourdault Martin. Gourdault was a student of Marcel-Andre Baschet and Schommer at the Ecole des Beaux-Arts in Paris. His participation in the Spanish-French exhibition in Zaragoza in 1908 contributed to the strengthening of the economic ties between the two countries. He was a member of the French Artists from 25 years. On two occasions he was a pathologist for the Prix ​​de Rome . Burial in the Deux-Sèvres was noted in 1910. In 1912 he won the National Award Salon with Walk on the beach. He traveled to Tunisia in 1905-06 and then moved there in 1912. 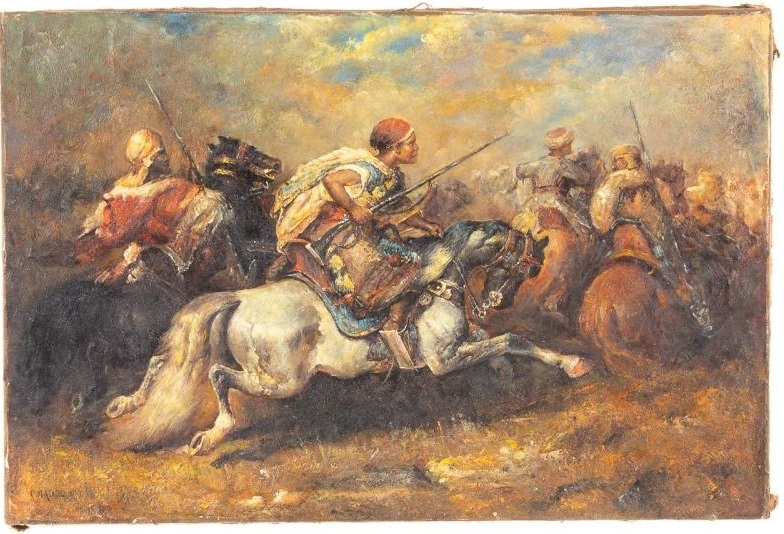 It is this period that he painted Caravan in Wadi Gafsa , Sidi-bou Olives Sahib or Arabian riders . He died of the consequences of his injuries during the First World War , in the military hospital of Givenchy-le-Noble. He was hit by shrapnel on December 28, 1914. His comrades wanted to carry a stretcher, he refused. He died eight days later, on January 5, 1915. Mythology Create a free website or blog at WordPress.com.